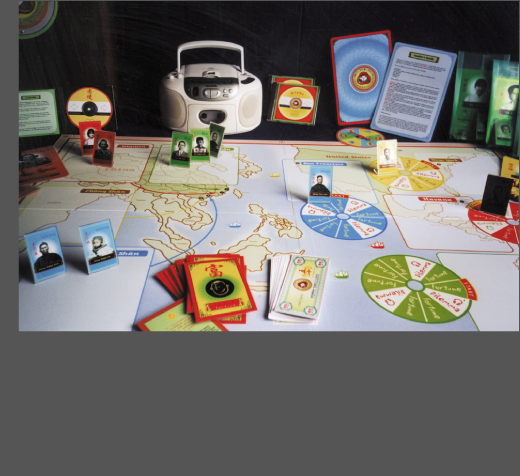 a portable kit designed for outreach to regional 5th grade school groups. Written and audio scripted in English, Spanish and Mandarin, it brings the interpretive content of this small Museum into New York City regional classrooms. The project team included the Museum’s curator, representatives from the Chinese Cultural Community Center and a local social studies teacher. Actors fluent in Spanish and Mandarin were contracted to perform the audio narrative portions of the game. This game was the winner of Print Magazine’s Annual Award for 2000 and the 79th Annual Art Director’s Club Design Award.